On the last Saturday of November 2013, Olha Onyshko received a phone call from her mother in Ukraine who was crying and repeating: "the girls on the square were beaten so badly." Onyshko left home and family in Bethesda, MD, and "The Women of Maidan" was spawned. 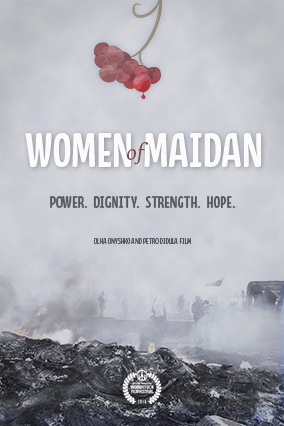 Her deeply moving film bears witness to how ordinary women became the sustaining heart of the fight against the corrupt regime to win a better future for their children. Olha Onyshko is a documentary filmmaker and media producer in the Washington, DC-metropolitan area. Onyshko began her career as a broadcast journalist in Lviv, Ukraine, where she was also active in political campaigns for newly independent Ukraine. Then she moved to Kyiv to work on educational campaigns advocating for democracy, market economy and human rights. After moving to the US in 2002, Onyshko turned to documentary filmmaking, hoping to have her voice heard back home. She obtained an MFA at the American University. Her debut documentary, "Three Stories of Galicia", depicted humanism in the midst of horrors and atrocities during and after World War II. It screened in twelve countries and caused a stir regarding historic memory and its role in the current events. While she hoped filmmaking would help to get her messages across, she never expected it would send her on a joyful journey of discovering the artist in herself.